This case study shows the process of virtual prototyping applied in the development of the VINCI project. 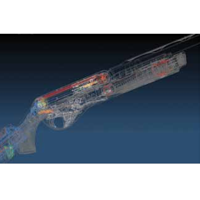 After experimentally characterizing the phenomenon of the shot, a complete multibody model of the gun was built using MSC Software’s Adams ™ to determine a satisfactory configuration of the weapon. This configuration was then used to develop the first physical prototype, on which kinematic and dynamic parameters were measured in order to calibrate its behavior with respect to the Adams multibody model. To develop a conceptually new weapon designed as a modular system and an integrated system of recoil reduction. Adams assisted in determining a configuration of the weapon and to calibrate its behavior. Marc was used to ensure the mechanical strength of the weapon.